The point was that hurricanes are caused or intensified by the man-made climate change that we’ve experienced in recent decades, and that Trump ignores that supposedly obvious fact, bringing about destruction. Never mind that, between Wilma in 2005 and Harvey in 2017, no major hurricane (Category 3 or higher) made landfall in the continental United States. That’s the longest such hiatus ever recorded. Never mind that, according to the National Oceanographic and Atmospheric Administration, 40 major hurricanes hit the United States in the 55-year period between 1906 and 1960. In the following 55 years, during the era of global warming, the number was 26. The number in the worst categories, Categories 4 and 5, fell from 12 to 5. This follows state legislation signed by Brown requiring utilities to get all their electricity from “zero-carbon” sources by 2045. Massive expansions of hydropower and nuclear power are off the table, so that means relying mainly on intermittent sources like wind (which works only when the wind blows) and solar (which works only when the sun shines). California officials claim the state currently gets about a third of its electricity from “renewable” sources. In June, the price of electricity in California was 65.3 percent higher than the national average. The difference would be greater except for the fact that some 41 other states have their own, smaller scams driving up electricity prices by requiring electricity consumers to buy expensive, unreliable wind and solar power. Jerry Brown just wants to do to America and the world what he and his fellow environmentalists have already done to California. This isn’t the first time that experts have sounded the alarm about climate change. In the 17th century, witches in Europe were burned for their role in the climate change that caused crop failures. In 1932, the Times warned: “NEXT GREAT DELUGE FORECAST BY SCIENCE/Melting Polar Ice Caps to Raise the Level of Seas and Flood the Continent.” The following year, leaders in Syria blamed Western influences for climate change, so they banned the yoyo. Really. Over the years the hypothesis has been refined, and more evidence has come along to support it. It is now pretty clearly agreed that the C02 content will rise 25% by 2000. This could increase the average temperature near the earth’s surface by 7 degrees Fahrenheit. This in turn could raise the level of the sea by 10 feet. Goodbye New York. Goodbye Washington, for that matter. 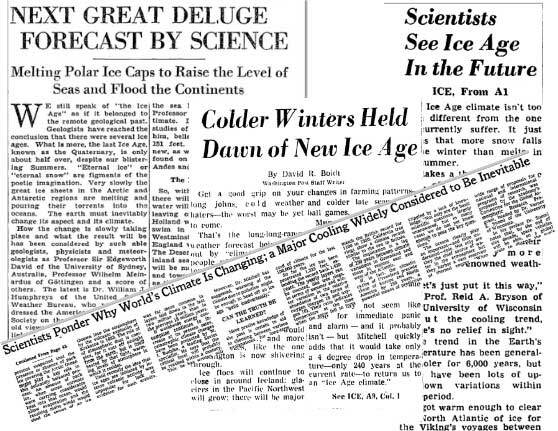 Back to cooling: “Scientist predicts a new ice age by 21st century,” said the Boston Globe (1970). “Ice Age, worse food crisis seen,” declared the Chicago Tribune (1974). “Pollution Could Spur Ice Age, NASA Says,” reported the Beaver County Times (1974). “Oil Spill Could Cause New Ice Age,” asserted the Milwaukee Journal (1975). Always, whether the problem is warming or cooling, the solution is greater control of the economy, and of all human activity, by politicians and bureaucrats. They’re the only ones smart enough to save us. Today, in the time of the Climate Resistance, “addressing climate change” is a euphemism for denying billions of people access to affordable energy—with victims ranging from working-class Americans to the world’s poorest in sub-Saharan Africa. And while the vulnerable suffer, wealth and power is transferred to the likes of biofuel processors and the bureaucrats of the Environmental Protection Agency (EPA) and the European Union. Real people pay a real price when policies are based on ignorance of history and a half-understanding of science, on irrational fear and sensationalism, and on the latest kookery from the media and political class that stands to benefit when people freak out. Robert Frost wrote, “Some say the world will end in fire, Some say in ice.” For the panic-mongers, either scenario will do.